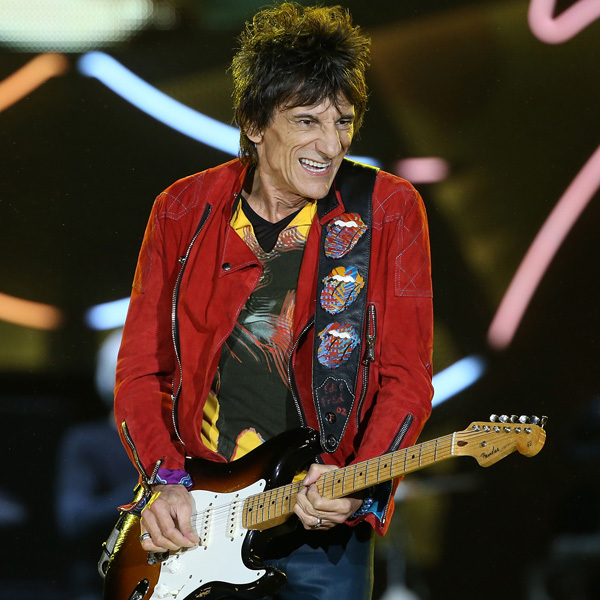 Is Ronnie Wood rock music’s ultimate wingman? Born in 1947 in an outlying district in London, he’s a guitar-playing guy who came into the world at just the right time. After knocking around a bit in the capitol’s hothouse music scene, he got a gig in 1967 playing bass for the Jeff Beck Group and never looked back. When the restless Beck dissolved that version of JBG, Wood and vocalist Rod Stewart quickly joined forces with Ronnie Lane, Ian MacLagan and Kenny Jones from the beloved Small Faces whose own frontman, Steve Marriott, had left to form Humble Pie. With the Faces, Wood went back to shouldering a six-string and took up his stage right position, dishing out his buzzing riffs and slide guitar fills through several notable albums (and co-writing such great tunes as “Stay With Me” and “Ooh La La”) and high-spirited tours with that archetypal group of working-class blokes made good. Oh, and since the mid-70s he’s been a Rolling Stone. So life’s been good for this son of a long line of river barge operators—he’s been rock royalty for over four decades without ever seeming to hog the spotlight. Employing the time-tested tricks of the trade (rooster haircut, low-slung guitar, dangling cigarette) Wood’s been a reliable foil to Mick Jagger and Keith Richards in rock history’s most durable top-line act. He’s also played with Bob Dylan at Live Aid, represented the Stones at the Last Waltz concert, had an affair with rock super-muse Patti Boyd Harrison, been in and out of rehab several times and was twice married to models—the second one divorced him several years back after he had a fling with a barely-legal Russian girl. I think that about takes care of the checklist. This wouldn’t be Ronnie Wood’s only solo LP. His most successful one in the States would come in 1979 with Gimme Some Neck, which led to the short-lived semi-supergroup with Keith Richards called the New Barbarians. But mostly, life with the Stones has kept him pretty busy over the years, with occasional solo outings to fill the gaps and keep him (mostly) out of the tabloids. When you’re this high up in the court of the Royal Rock Stars, it is good to be The Wingman. My latest book, Rock Docs: A Fifty-Year Cinematic Journey is now available. You can view a 30-page excerpt by clicking on the image of the book cover on the upper right.